Information on Msc Cruises to Mozambique, Cruise Guide to Msc Opera and MSC Sinfonia with Starlight cruises from Durban to Mozambique. MSC Sinfonia Setting new standards in cruise ships, Sinfonia will be the finest floating hotel South Africa has ever seen. 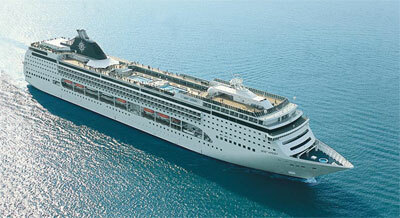 Cruises to Mozambique including Barra, Maputo and Portuguese Island Mozambique. MSC SINFONIA has a range of accommodation to meet your budget and specific requirements. Some of the rooms can accommodate more than two people, making it easier to have your family share a cabin with you. The lowest cost rooms are the standard inside rooms. 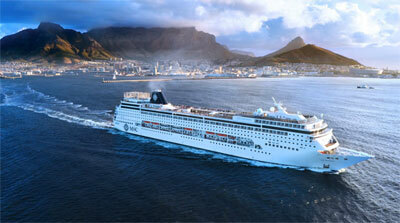 Now the magnificent Msc Opera is also operating cruises from Durban to Mozambique and South Africa. Want your kids next door? If you and your friends or partner (sharing the same cabin) are between 18 and 29 years. A cabin just for your kids? If married life is a journey, then a cruise holiday is the perfect start! If you’re travelling alone, you can enjoy the luxury of having a whole cabin to yourself. Indulge in a holiday to remember, one steeped in exoticism, escapism, luxury and style. MSC Cruises’ South Africa cruise is designed to stimulate the senses as you take in everything from the beautiful Portuguese Island to the bustling port city of Durban, all under the magical African sun. Join MSC Cruises on an unforgettable adventure with a cruise to one of the world's most fascinating continents. Immerse yourself in the sights and sounds of this stunning country as you experience nature’s glory, from the forest and the savannah to the endless ocean and simply glorious beaches that are like nowhere else on earth. A South Africa cruise aboard MSC Opera or MSC Sinfonia is the best way to discover Africa in style. Our elegant liners are equipped with every possible amenity and all bear the hallmark of welcoming and distinguished surroundings and a refined and exclusive atmosphere – a place where ‘vacation’ truly rhymes with ‘relaxation’. You will travel in elegant Italian style on the MSC Sinfonia – a luxury liner that offers a veritable ‘symphony’ of delights. From the well-appointed cabins to fabulous on-board entertainment, there really is no better way to experience this country. Onboard you’re spoilt for choice – from Virtual Golf to beauty centres – even kids and teens are catered for too with dedicated play and social areas. Treat yourself to a voyage of a lifetime, a world of fascinating and memorable experiences… the heady rhythms and sounds of this magical continent are like the heartbeat of the world! A warm welcome and impeccable service awaits you. Top class meals, the comfort of your cabin, and facilities dedicated to health and wellbeing make life on board a pleasure. A friendly professional is always on hand to suggest a special dish and the ideal accompanying wine, to provide you with quality cabin service or simply give you a warm smile. We do all this and more to put you, our guest, first and to make your dream holiday come true. availability. Actual cruise pricing is only confi rmed at the time of booking. *Port & Baggage charges, Insurance and Service Fees are excluded from the offer. 18 pays just 60% of the adult fare and the remaining children only pay the mandatory charges. The promotional fares are subject to availability and are applied to the Regular Quoted Fares. Fare while kids pay a reduced rate. Prices per child starting from: R450 per night (inside), R500 per night (outside). This applies to a maximum of 2 children in a cabin and 1 cabin per family. For departures in high season (Christmas, New Year, Easter, School Holidays), prices are subject to an increase. *The category and location of the second cabin will be confi rmed by the company. Give your kids the luxury of their own cabin* at a very special price. Parents pay the Regular Quoted Fare while kids pay a reduced rate. Prices per child starting from: R450 per night (inside), R500 per night (outside). This applies to a maximum of 2 children in a cabin and 1 cabin per family. honeymooning couples feel really special, as well as giving them a great deal. All honeymooners are eligible for a 10% reduction on the Regular Quoted Fare as well as a free one category upgrade.This offer cannot be combined with other special offers.This offer is valid only for 2 people sharing. An offi cial marriage certifi cate must be presented when making your reservation. If you’re travelling alone, you can enjoy the luxury of having a whole cabin to yourself. A surcharge of 50% will be applied on your cruise fare, but this promotion is subject to limited availability, so please check with your travel agent when booking. By prior arrangement, at a cost of R1100, it is possible to have the Captain or the Cruise Director preside over an exchange-of-vows ceremony on board in a private venue. Please note that this “wedding” is not recognised by law. During the proceedings, you will exchange vows, receive a certificate, a wedding cake and a glass of sparkling wine and/or orange juice. The services of the ship’s photographer is optional at an extra cost. NOT applicable to Peak Season cruises. Honeymoon discount cannot be combined with any other special discounted offer.